DENNIS Rodman has addressed his bizarre television meltdown yesterday. The former NBA star, who was in Singapore for the historic summit between Kim Jong-un and Donald Trump, went viral after he dissolved into tears during a live CNN interview yesterday. When asked about it on KIIS 1065 this morning, he laughed it off and jokingly attributed it to the weather. "It was very hot and humid. Don't take that in a negative way - I wasn't trying to make people feel sorry for me. 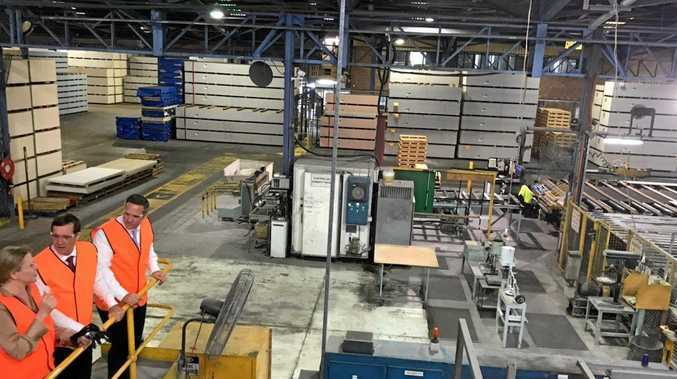 It was just very difficult to handle that situation," he said. "But love is love, love is always there no matter how you look at it, it comes from within. People need to understand we can forgive people … we're all about giving people chances." Rodman may be the only person in the world who has personal relationships with both Mr Trump and Mr Kim. He has been to North Korea several times and has repeatedly defended the repressive nation to the US. When pressed to clarify his exchange with former president Barack Obama - which appeared to inspire his meltdown yesterday - Rodman said: "We had a situation with Obama which was just one of those things where he didn't want to touch that … he was more focused on more important things. "But times have changed, people are now trying to visualise how this is going to pan out with Kim Jong-un and North Korea. "I think it should work out pretty well." The former NBA star described the summit as "a very exciting day for Singapore and the people around the world". "I hope people enjoyed the fact that they were trying to make amends of certain things," he said. Dennis Rodman has personal relationships with both President Donald Trump and North Korean leader Kim Jong-un. 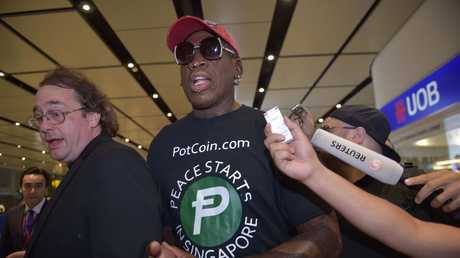 Rodman appeared on CNN yesterday wearing dark sunglasses, a "Make America Great Again" hat and a t-shirt advertising Potcoin, a Marijuana cryptocurrency. During the interview, Rodman opened up about his personal friendship with Mr Kim and his struggle to be taken seriously. He grew emotional as he recalled trying to reach out to former US president Barack Obama on North Korea's behalf. "Obama didn't even give me the time of day," he told the network. "I asked him - I said I have something to say from North Korea. He just brushed me off. But that didn't deter me. "When I said those damn things … when I went back home. I got so many death threats," he continued, choking up.